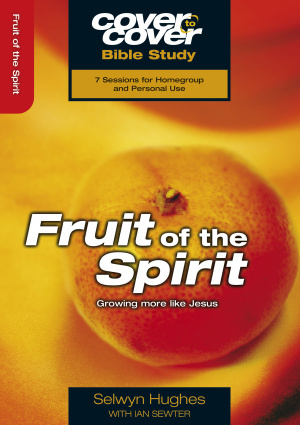 Learn from the life giving fruit of the Spirit with this study from Selwyn Hughes which shows how we can all live more like Christ. The Christian in whom the fruit of the Spirit is fully evident gives the best portrayal of saintliness it is possible to find. How, then, does God go about painting a portrait of a saint? His canvas is the heart of one who is redeemed. The colours that He puts on His palette are joy, peace, patience, kindness, goodness, faithfulness, humility and self-control. Each of these is needed if the portrait is to be a masterpiece. And these colours are not pastel shades; each one is deep and rich and vibrant. The model He uses is the peerless example of His own Son, in whom every quality is seen to perfection and wonderfully balanced by every other. All God asks is that you hold still: that you stop trying and start trusting. Do this and you can bear fruit that will last and glorify Him. Cover to Cover Fruit Of The Spirit by Selwyn Hughes & Ian Sewter was published by CWR in November 2005 and is our 1216th best seller. The ISBN for Cover to Cover Fruit Of The Spirit is 9781853453755. Be the first to review Cover to Cover Fruit Of The Spirit! Got a question? No problem! Just click here to ask us about Cover to Cover Fruit Of The Spirit.